Apparently released as a promotional tool to radio stations (seems to me Radio and Records and/or some other publications did these back in the day), Billboard Magazine made this composite of Country station 1050 WHN New York. I originally guessed the date of this as Memorial Day 1976, but as visitor Joe Crain comments below, one reported news item specifically dates this as 1977. Read his comments (and others) below this post. This starts out with Larry Kenny (whom we just featured doing his first morning show on WYNY “New York 97” back when it was on 97.1 long before there was a WQHT, or a country version of WYNY) playing the Big Apple’s Country music, then moves on to Lee Arnold, Del Demontreau and Ed Baer. WHN would last well into the 80s as a Country station, before Emmis would flip the format and calls to Sportsradio 1050 WFAN, then move the whole thing to 660 when WNBC expired. The audio quality on this is superb and comes from the original source cassette, so enjoy this scoped 9 minutes of 1050 WHN. Thanks so much for another great aircheck. WHN sounded so great at this time. In the “taking a stab” department, I beleive this was actually Memorial Day 1977. I matched up the songs that the DJs said were the latest releases with the year that they are listed by Joel Whitburn and they all correlate to 1977. so, if I am correct, the date would be May 30 1977. The Beverly Hills Supper Club fire in Southgate, Kentucky is the third deadliest nightclub fire in U.S. history. It occurred on the night of May 28, 1977, during the Memorial Day weekend. 165 persons died and over 200 were injured. The club was a major attraction just 6 miles outside of Cincinnati, Ohio and drew its talent from Las Vegas, Nashville, Hollywood and New York, among other places. It had opened under the then-current management in 1971, but as early as 1937, the site had been a popular nightspot and illegal gambling house. Several additions were completed by 1976, creating a sprawling complex of function rooms, corridors, and service areas. It is believed as many as 3,000 patrons and 182 employees were inside the club at 9:00 p.m. on the evening of the fire, just as the “early show” was beginning in the Cabaret Room. This was the larger of two showrooms with a stage, and it was filled with 1,300 patrons. Because of overcrowding, additional guests had been squeezed into this room on temporary seats erected on ramps to the stage. Throughout the club patrons were enjoying their meals and drinks in several restaurants, bars, private party rooms, and the two large performance rooms. An awards banquet for 425 people was taking place in the “Empire Room.” Upstairs, functions were taking place in the six Crystal Rooms. A wedding reception in the Zebra Room had ended at 8:30 p.m. Some guests complained that the room was becoming overheated, though no smoke was in evidence yet. The doors of the Zebra Room were closed after the reception ended, and the fire continued to smolder undetected for another 25 minutes. Two waitresses, looking for tray jacks, entered the Zebra Room at about 8:56 p.m. They saw dense smoke hanging near the ceiling and notified management immediately. A phone call was placed to the fire department at 9:01 p.m., and the first fire engine arrived in only three minutes, as it happened to be in the area of the club at the time of the call. Meanwhile, the management used two fire extinguishers inside the Zebra Room, but to little effect. The fire had taken hold and could no longer be contained inside the room. The flames spread so rapidly, a full evacuation of the sprawling, crowded building was not possible. A lack of a sprinkler system and audible automatic fire alarms added to the dangerous conditions. These basic safety standards were required by law, but had not been installed and the local volunteer fire department had not forced correction of the deficiencies. As the fire erupted at the front of the club, the comedy team of Teter and McDonald were performing on stage down the corridor in the Cabaret Room. Singer/actor John Davidson, the scheduled headliner, was in the dressing room preparing for his show. A teenage busboy named Walter Bailey, who had witnessed the onset of the fire, raced down the long hallway to the rear of the building. As he made his way along the corridor, he shouted warnings into the various bars and rooms that he passed. Inside the Cabaret Room, he took the initiative to grab a microphone from the comedians on stage and warn the audience to begin evacuation. He pointed out the exits and urged them to move quickly but without panic. Many patrons immediately began to heed instructions, but many others apparently hesitated because they thought the fire warning was part of the comedy act. At this time there was no hint of smoke or danger in the Cabaret Room. The comedians attempted to calm people by suggesting that the show would continue once the fire was extinguished. Only two minutes after Walter Bailey’s warning, the fire burst its way along the corridor and exploded into the Cabaret Room with a fireball. Thick smoke simultaneously filled the building’s ventilation system, making it difficult to see and breathe. Full scale panic ensued at this point, with some in the crowd jumping from table to table and many becoming entangled at blocked exits. Screaming patrons, some of whom were on fire, ran in different directions. Lights throughout the complex failed, adding to the panic. Later, at one of the tables, the bodies of six patrons would be found still sitting upright in their seats. Bodies were heaped in piles at either side of the stage. The majority of the deaths would be blamed on poorly marked exits, flammable carpeting, and seat cushions that emitted toxic fumes when burned. After searching the hospitals, John Davidson found his music director dead in the temporary morgue. The comedy duo and Walter Bailey escaped the blaze. President Jimmy Carter sent a hand-written letter from the White House to personally thank the young busboy for his bravery and initiative in spreading the news. Fire experts agreed that the death toll would have been much higher without his timely warning. Investigation revealed that local and state government oversight of the building’s fire safety standards had been woefully inadequate. The nightclub’s owners made additions to the building in a piecemeal fashion and had no comprehension themselves of the need to have code-compliant wiring or non-flammable materials used in the construction and decoration. It was revealed that the building’s architect was not licensed to practice in the state of Kentucky. The club’s owners also claimed to be unaware that it did not meet fire code requirements. For example, the staircase were required to be enclosed with fire doors on each level of the building. Important state and federal lawmakers visited the club from time to time and were also unaware or willfully ignorant of the fire safety lapses throughout the building. The tragedy led Kentucky Governor Julian Carroll to initiate an overhaul of the way in which the state government supervises code enforcement. Governor Carroll hoped that the Attorney General of Kentucky would be able to prosecute various officials. However, a secret Grand Jury and an independent investigator both recommended to him that there was no criminal liability sufficient to seek any indictment for homicide. “Old technology” aluminum wiring would be banned in places where it was not already prohibited. John Davidson later performed in Cincinnati at a huge charity concert to raise funds for children who had lost their parents in the fire. The Beverly Hills Supper Club was never rebuilt. Though other parts of the property have been redeveloped, the actual site of the fire remains vacant as of 2008. This was the first lawsuit to utilize the concept of “enterprise liability” and one of the first disaster cases to sue as a class action. Wikipidia… I really gotta start using that more often. Now, Joe (and everyone else), I believe we have to be careful about reprints. I’ll have to read up on it but I think one can only quote a few lines or paragraph while giving credit, otherwise a one-liner with a link to the source article is appropriate. I’m not complaining. Thanks for the info Joe I’ll change the post appropriately. This is just one of many gems I got from former WHN PD Ed Salamon, now the Exective Director of CRB. Many of the cassettes I got were not labeled, or barely had any info on them. Thanks for the date! I really enjoyed this. It brough old memories plus I could not detect a New York accent then, they sounded normal to me. However since I moved out of the area in 1986, the accents are strong, especially Del Demontreau’s. This was a station composite tape we submitted to Billboard to be considered for it’s annual industry awards. In the late 70s, WHN won a number of Billboard awards as Station of the Year, Program Director of the Yea, Air Personality of the Year. At least one year, WHN won all three. In the 80s, WHN jock Del Demontreux did double duty as the Mets’ public-address announcer at Shea Stadium (the team’s ballpark from 1964 to 2008). Ed Salamon, who had some high position at WHN (I forget right now what it was, has a book entitled “WHN: When New York City Went Country.” I highly recommend it to anyone who was a loyal WHN listener when they were country. I couldn’t get it where I’ve lived all my life (Fairmont, West Virginia), but lived for trips to NYC so I could experience It there. That was a golden era, IMHO. Interesting to hear Ed Baer on this old clip. He is still on WHUD from Peekskill, NY. I remember listening to his show “The Ed Baer Affair” in the 1990’s on WHUD. 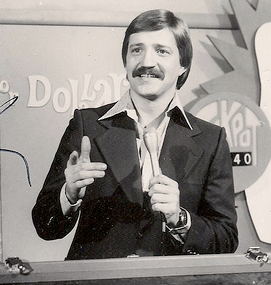 On a side note, who was the WHN DJ from the 1970’s who MC’ed “Bowling For Dollars”? I cannot recall his name but he always gave the station a plug on that show. Larry Kenney and Mets broadcaster Bob Murphy hosted “Bowling for Dollars” on WOR (now WWOR), Channel 9. One other thing, thanks for an update on Ed Baer. Does anybody know what Lee Arnold is doing these days? He must be 85 by now, or very near it. Dan Taylor did the “1050 WHN” station ID. Was this inserted later, as he didn’t come to WHN till ’79?